Viridian 100% Organic Black Seed Oil contains Nigella sativa is an exotic addition to Viridian's extensive essential fatty acid range. Also known as the Blessed Seed, black cumin seed is popular in the Middle and Far East. With an aroma similar to eucalyptus or tea tree, Viridian Organic Black Seed Oil can be taken internally or used as a head or chest rub. Certified organic by the Soil Association - better for the planet, better for you. One of black cumin’s most popular and effective uses is the treatment of diseases related to the respiratory system, including breathing problems, bronchitis, rheumatism and cold symptoms. The seeds help increase body tone, stimulate menstrual period, and increasing the flow of breast milk in nursing mothers. 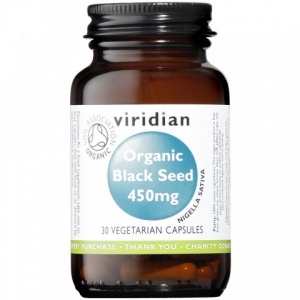 Organic Black Seed powder 450mg.